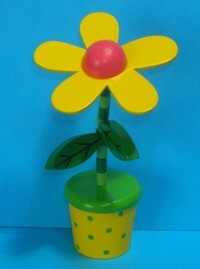 This push puppet of a daisy flower is in a yellow vase which has been hand-painted with green spots. Push up on the bottom and the flower will collapse - maybe it needs more water ! !